Whether you have spent countless sleepless nights pouring over Greek flash cards or can barely manage to order a gyro, you can reach beyond your English Bible to the original Greek in four easy steps. In Luke 8:46, a desperately ill woman touches Jesus in order to be healed. Jesus then says, “Someone touched me, for I perceive that power has gone out from me” (Luke 8:46 ESV). What does the word “power” mean in the passage? What precisely went out from Jesus? To find out, we need to investigate the Greek word behind the English word “power”. For those who don’t read Greek, the most effective way to make the English to Greek transition is to use a tool like the ESV English-Greek Reverse Interlinear New Testament. Simply find the English word “power” in the reverse interlinear and look at the Greek word placed below it—δύναμις (dunamis). Now that we know that the Greek word for “power,” dunamis (δύναμις), is the subject of our investigation, we need to formulate a working definition. If you are using print books, you can use Strongest Strong’s Exhaustive Concordance of the Bible for this step. The key to efficiently using this resource is to take note of the Strong’s Number allocated to the word dunamis (δύναμις) in the interlinear Bible—1411. We can use this reference number to look up the word numerically in the Greek to English Dictionary-Index to the New Testament appended to Strong’s. Here we see that dunamis (δύναμις) can refer to a literal or figurative force, specifically the ability to work miracles, or even to a miracle itself. With one of these working definitions in mind, the next step is to investigate how this definition functions in literary contexts and biblical passages. The key to an efficient study of a Greek word is not to reinvent the wheel by personally searching through literature of various time-periods. Rather, streamline the process by consulting a resource such as the Theological Dictionary of the New Testament (Abridged in One Volume) (TDNT). The TDNT provides concise articles that explain how and where a word occurs in various passages and contexts. This resource accommodates to English readers by providing a table of English keywords. When we look up the word “power” we are directed to the entry discussing dunamis (δύναμις) on page 186. This entry discusses the word in Greek literature (such as Homer’s Iliad) and in the Greek translation of the Hebrew Old Testament (the Septuagint). While dunamis (δύναμις) in Greek literature often had to do with various forces (powers) moving and governing the universe, the Greek translators of the Old Testament viewed “power” as something God himself possessed and exerted. This shift in meaning further develops in the New Testament. When looking up a particular word in the New Testament, there are two things that should be considered: frequency (how many times a word appears) and distribution (where the word appears). We can use an interactive chart in Logos’ Exegetical Guide to determine the frequency of a word in the New Testament. Our word, dunamis (δύναμις), occurs 119 times. Although this is interesting, this statistic only provides us with a panoramic landscape. We must supplement it with details of the terrain—the context (or specific distribution) of each occurrence. We can use Logos’ concordance function or Strong’s to ascertain the predominant meanings attached to this word by the New Testament authors. 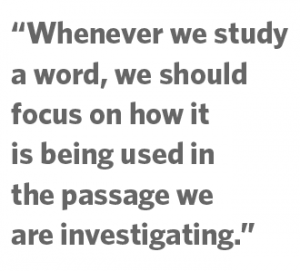 Whenever we study a word, we should focus on how it is being used in the passage we are investigating. The fact that Luke uses the word dunamis (δύναμις) fifteen times throughout his account—a frequency equaled only by Paul in 1 Corinthians—establishes that “power” is a central theme and emphasis of his Gospel. Now that we know that “power” is a central theme in Luke’s Gospel, we need to determine how the word is used throughout the book. Each occurrence of the word can be categorized by what it describes. When we categorize the different occurrences of dunamis (δύναμις) in Luke’s Gospel, we find that it describes four things. In the beginning of Luke’s Gospel dunamis (δύναμις) comes from the “Most High” (Luke 1:35). However, once Jesus endures a period of testing in the wilderness there is a shift. Jesus becomes “filled with the power of the Spirit” (Luke 4:14). From this point onwards, Jesus independently uses and distributes divine power, like God the Father (Luke 9:1; 10:19). Luke uses “power” to establish Jesus’ divine identity. Jesus’ “power” causes onlookers to scratch their heads and ponder the identity and message of Jesus (Luke 4:36). Now that we have determined how Luke uses the term in general, we can return to Luke 8:46 to reassess the meaning of dunamis (δύναμις) in light of our entire investigation. Judging from the usage of the term in various contexts (and specifically in Luke’s Gospel), it seems fair to conclude that this occurrence of dunamis (δύναμις) refers to the divine power contained and originated in the person of Jesus. The purpose of Luke 8:46 is to highlight the connection between Jesus’ divinity and the actions performed in his healing ministry. Numerous times throughout Jesus’ healing ministry, divine “power” finds its source in him (Luke 5:17; 6:19; 8:46). Dunamis (δύναμις) in Luke 8:46 subtly expresses that the presence and effect of “power” in Jesus’ earthly ministry indicates his divine identity. The Greek writers used dunamis (δύναμις) to describe spiritual and universal “powers”. The translators of the Greek Old Testament (Septuagint) used the word to describe something that originated from, and was distributed by, God. Among other usages, Luke primarily used “power” to describe something God the Father and Jesus possessed. *A lexicon is an in-depth dictionary about a specific corpus of writings. Because of this, lexicons can contain more lengthy and detailed entries than dictionaries.